Summer finally remembered where it was supposed to be and what it was meant to be doing and turned up with a bright, shiny day at long last. Since the school term ended we’ve had a long spell of very unsettled weather, almost changing by the hour rather than the day, which has made planning any sort of outing very difficult. 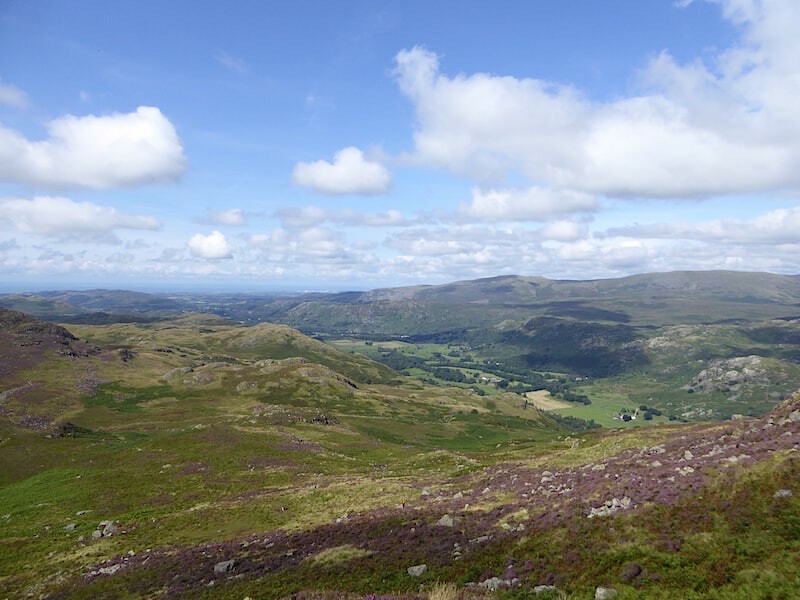 It has restricted us to taking short and very local walks just to get some fresh air and exercise, and we had also looked forward to spending a day at the Penrith Show but cancelled that as soon as we saw the rain bucketing down on the day of the show. We drove past the showground the day after and saw that the place was a quagmire, apparently tractors had to be called on to get cars out of the mud. We gave the steam gathering at Flookburgh a go and wished we hadn’t bothered. There had been a downpour the day before the show started so their grounds were in just the same state. We were up to the ankles in mud and water while being blown sideways under grey overcast skies. Trying to put the garden back to rights after day long rain has been very trying, any sunny spells which came along were quickly followed by lengthy spells of rain so back into the shed went the tools and back into the house went we. As for getting the washing dry outdoors, forget it, Mums with school age kids must be tearing their hair out by now! 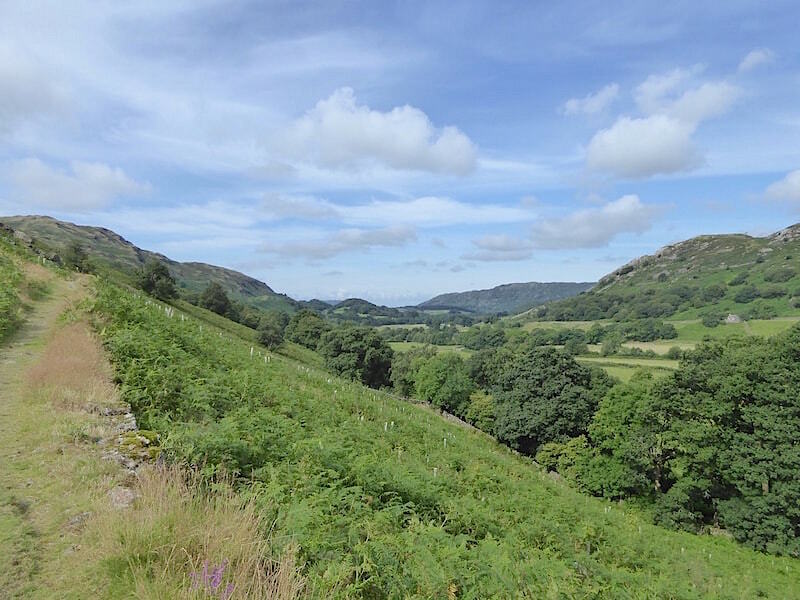 As a few hours release from this enforced house arrest seemed to be on offer we drove over to Eskdale, parked up at the little car park just by Jubilee Bridge and took a walk up Harter Fell which we haven’t visited for a very long time. To begin with – a few photos taken at the beginning of the drive …..
A sight we haven’t seen for a good while and an early indication of the seasonal changes to come. 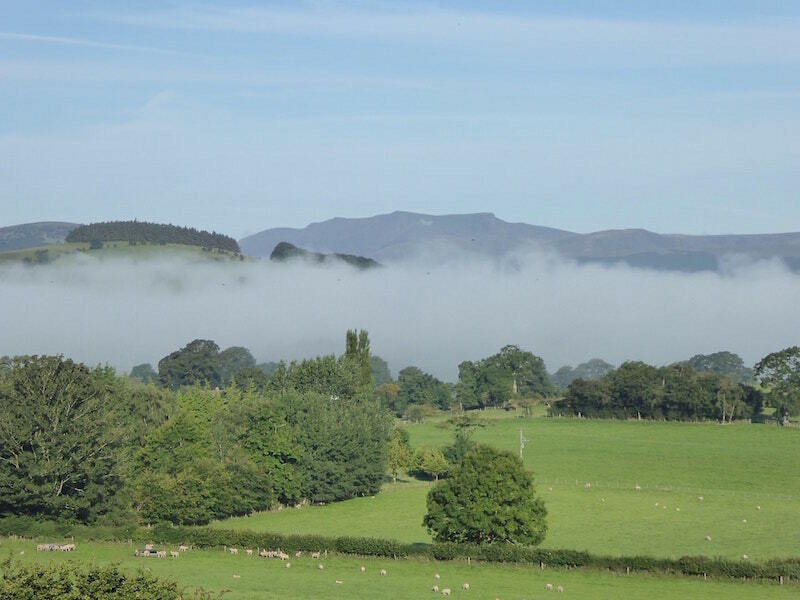 A cold clear night and a bright sunny morning have created ribbons of mist in the valleys, with Blencathra on the skyline behind them. 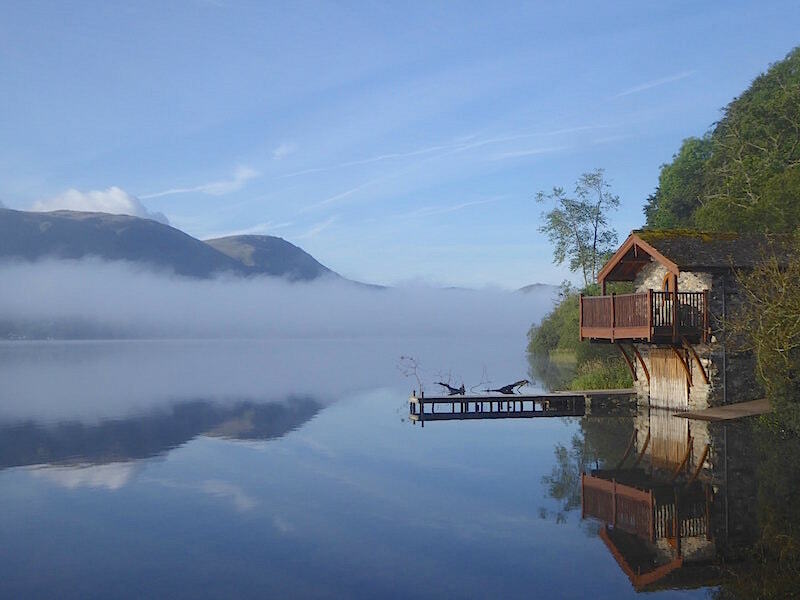 Rounding the foot of Ullswater it was just impossible not to stop and take a shot of this tranquil scene alongside the Duke of Portland boathouse. 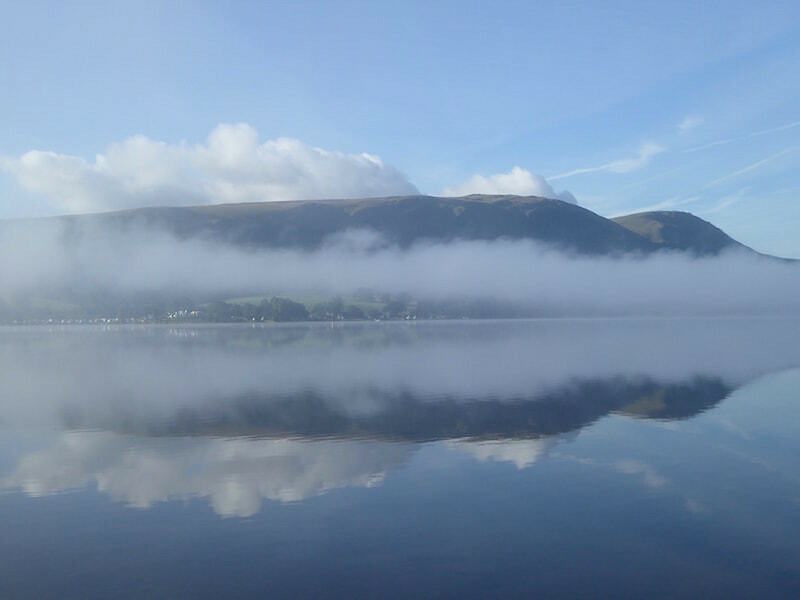 Reflections of Arthur’s Pike and Bonscale Pike in Ullswater . Back to the walk and here we are at the parking area just above Jubilee Bridge close to the bottom of Hard Knott Pass. The car is parked just behind me along the roadside and there is a large group of walkers just finishing kitting up out of shot on the left. Their cars have taken all the available spaces on the grass verge so the roadside option was the only one left to us. 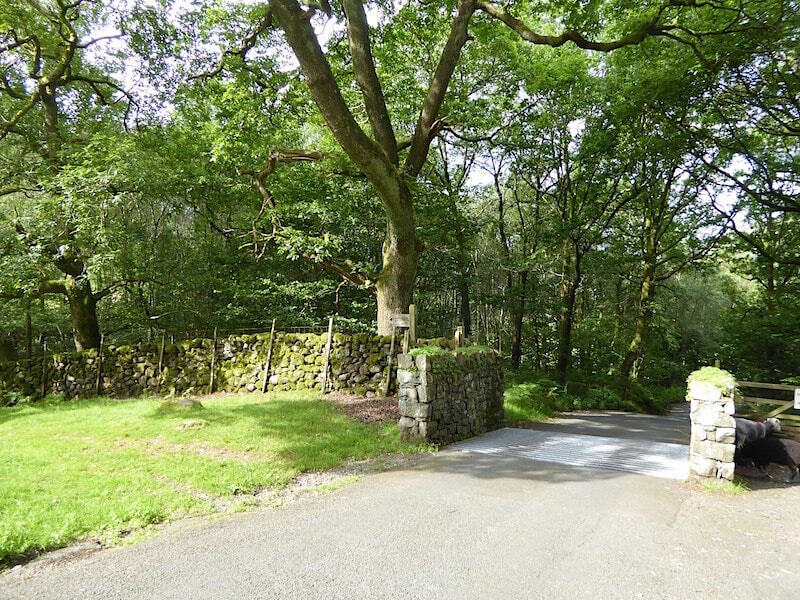 You may be able to pick out the signpost indicating the start of the path just by the wall on the left hand side. I was relieved that the large walking party headed off up the pass behind me and didn’t make their way down to the bridge. Being in close proximity to a large, noisy group wouldn’t be my idea of an enjoyable walk. 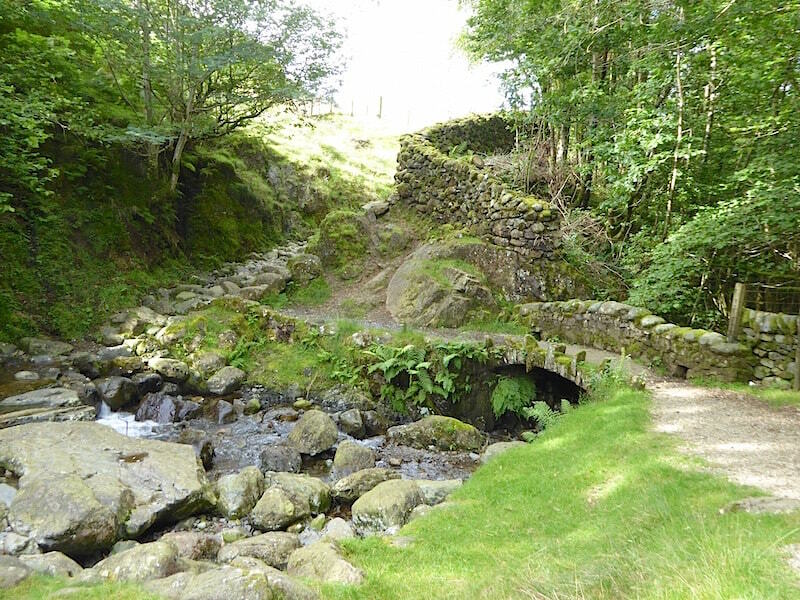 A very few strides down the path brings us to the little packhorse bridge spanning Hardknott Gill. It was named Jubilee Bridge to commemorate the Queen’s silver jubilee in 1977 although it has been there a lot longer than that. From the bridge we bear to the right and climb up to pass through a couple of gates to reach the track beyond. A couple of young Herdwicks keeping a beady eye on us from the safety of the fence corner. 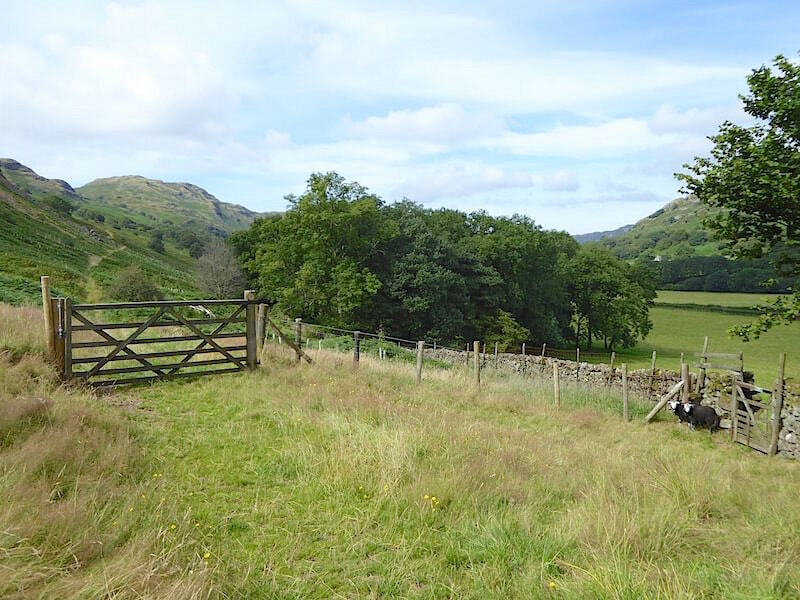 Beyond the gate and out onto the grassy bridleway traversing the fell side. 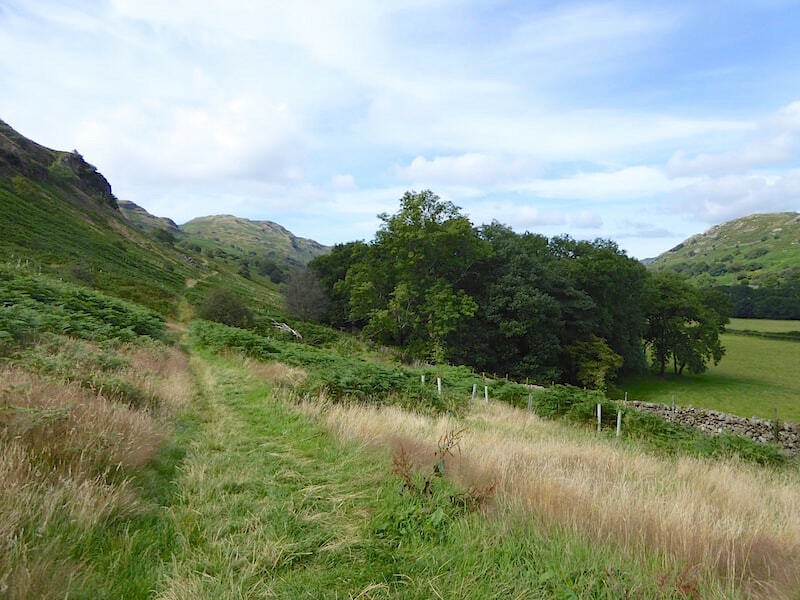 The bridleway climbs steadily but the gradient is gentle and provides a nice warm up for the leg muscles. 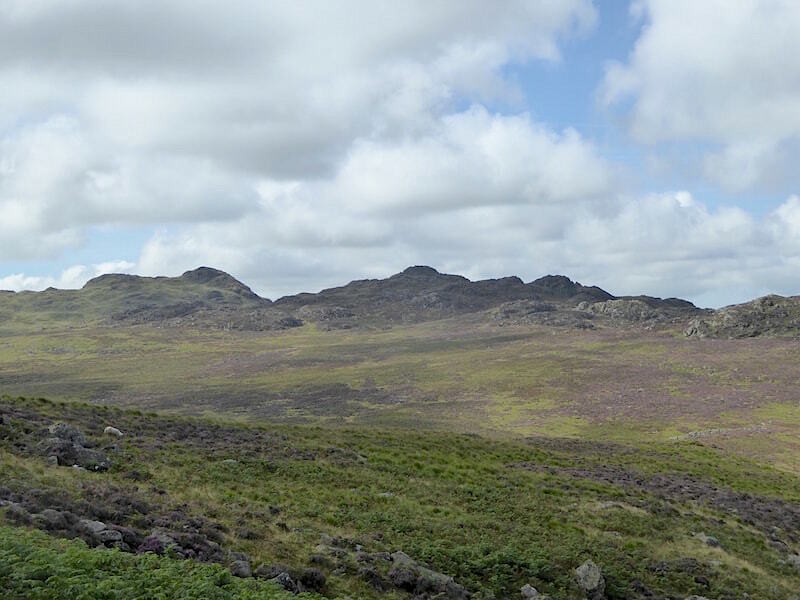 From the track we have a view along lower Eskdale. 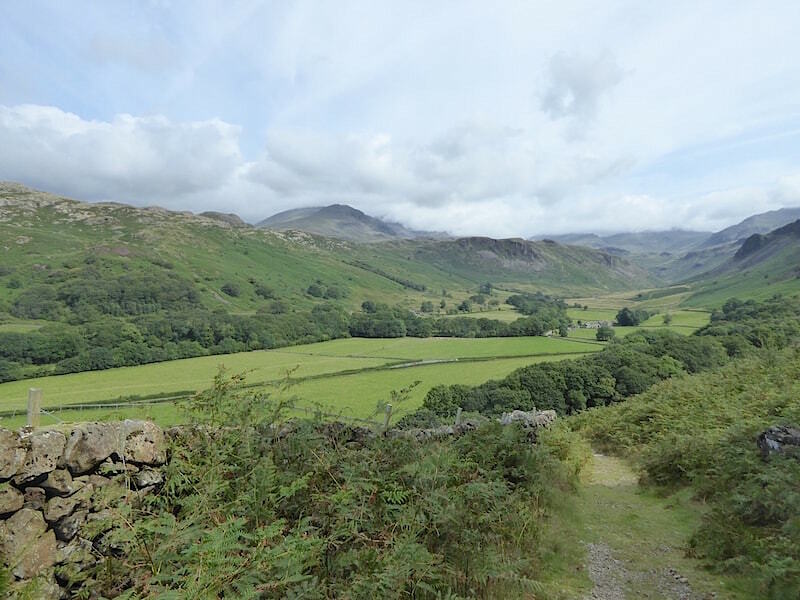 A look back along Eskdale from a little further along. 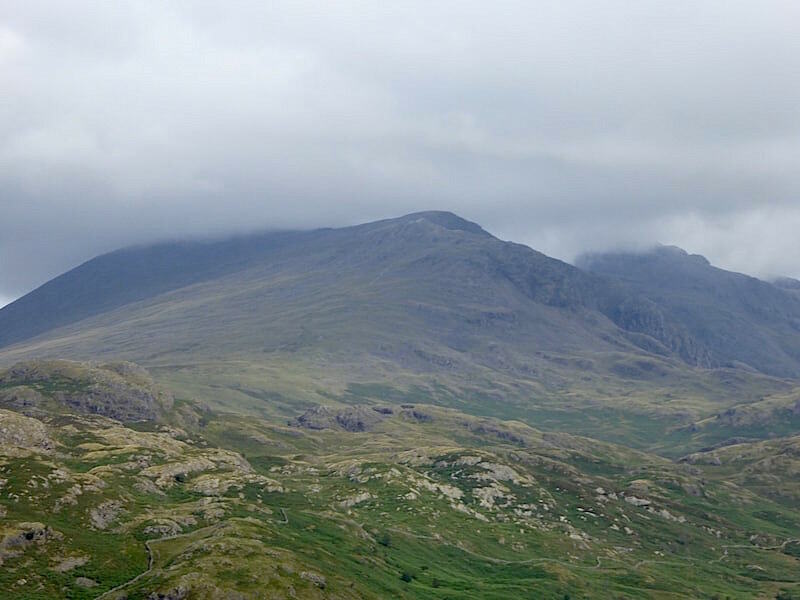 The Scafells, towards the centre skyline, obscured by cloud at the moment. Still climbing steadily through shoulder high bracken and across a number of small streams with Kepple Crag ahead of us. 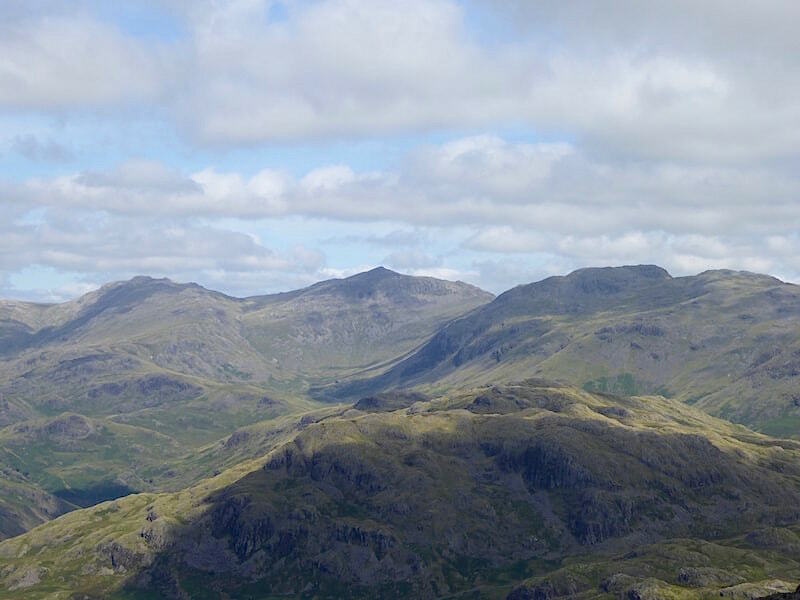 Another look back to see if the view of the Scafells is any clearer. The top of Slight Side is just about visible so things are slowly improving. A closer look at Slight Side summit. Kepple Crag is directly ahead of us as we pass through a gate in the wall on the right. 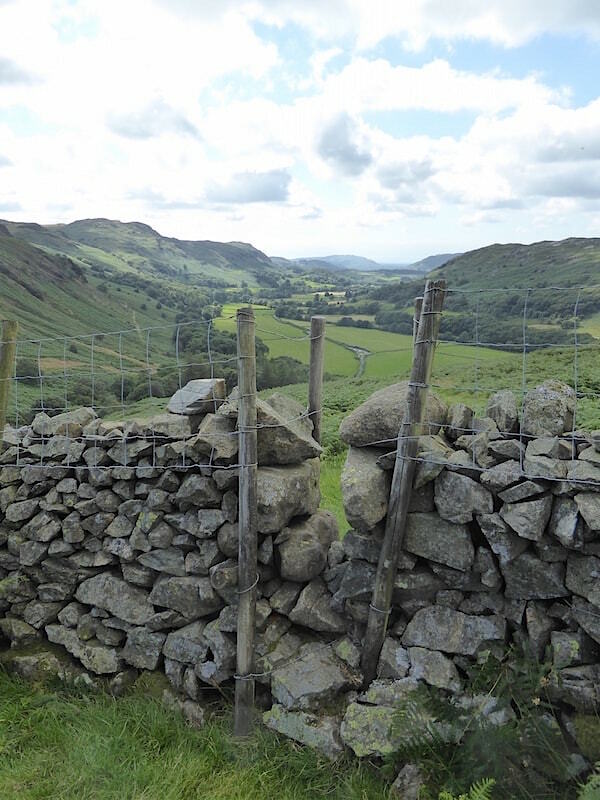 We don’t cross over the stile but continue on the path which now becomes much rougher and starts to bear left. 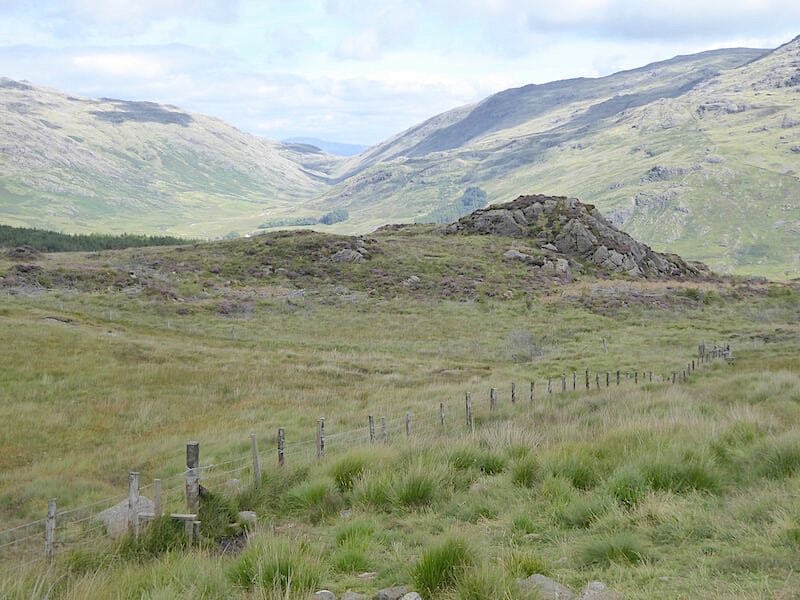 A look back from the gate we have just passed through, only a little cloud still to clear away from the Scafells now. The morning is heating up very nicely and its now very warm and muggy, although we’re not quite at the brow mopping stage just yet. 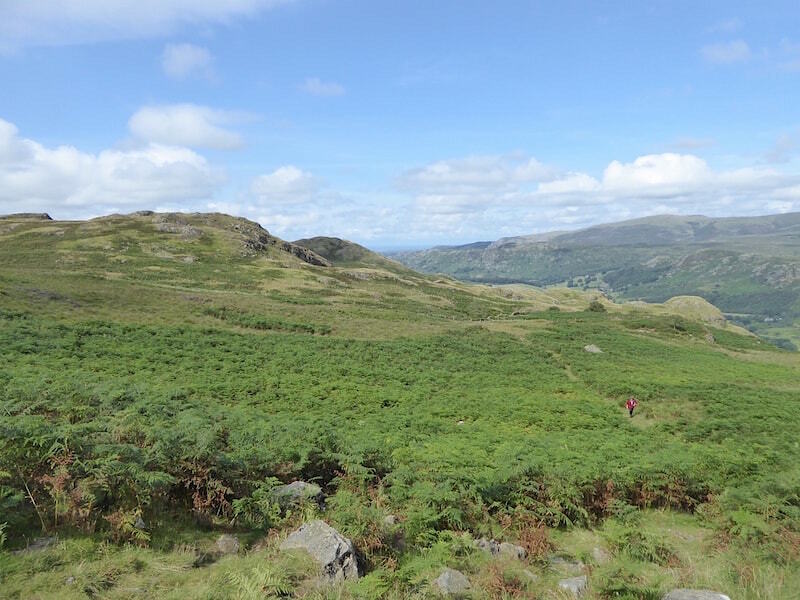 We leave the track just a short distance from the gate and turn off towards the left to follow the path through the bracken which will lead us around the right hand side of the summit rocks. 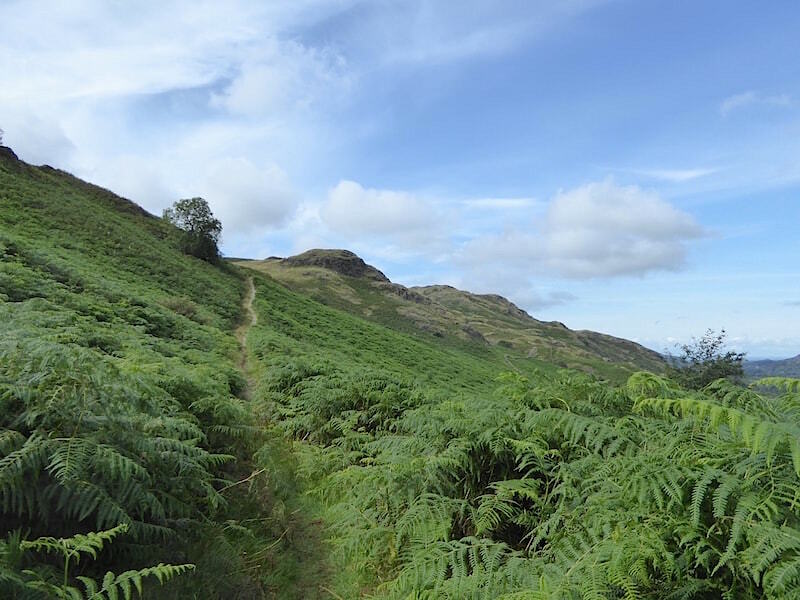 A short way along the rough track through the bracken I took a look back at our route so far. The lady walker behind us in the red jacket had been sitting on one of the rocks taking a break beside the path junction back down there. We exchanged greetings and comments about the fine weather as we passed her but that was all. I was surprised to see that she was still wearing what looked to be quite a warm jacket especially as the temperature was rising steadily. 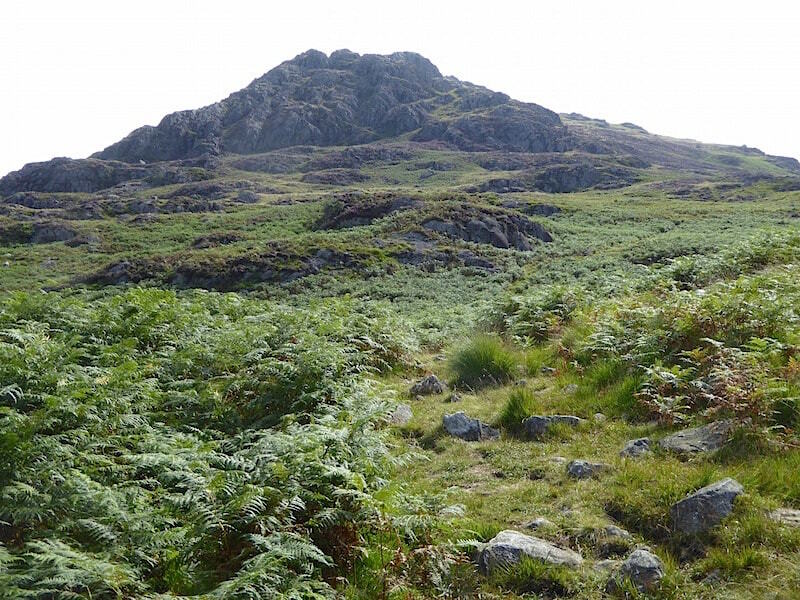 The path is uncertain in several places as it winds its way through bracken and boulders, and even close to it can be hard to spot and we lost it briefly while crossing one of the more bouldery sections. 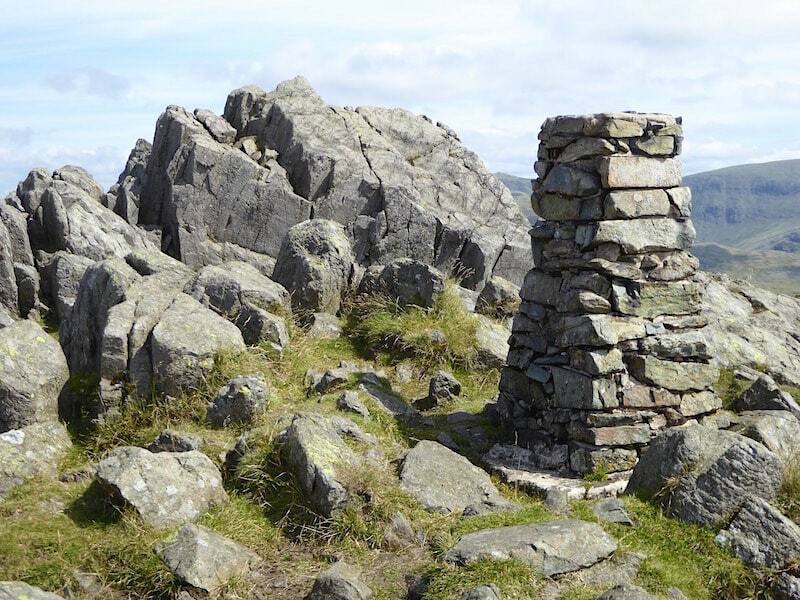 Fortunately I spotted one of the few cairns placed along it so we aimed for it and got back on track once again. It passes below and round the crags of the north west ridge so we don’t need to get out the ropes and carabiners, not that we have any with us in any case. 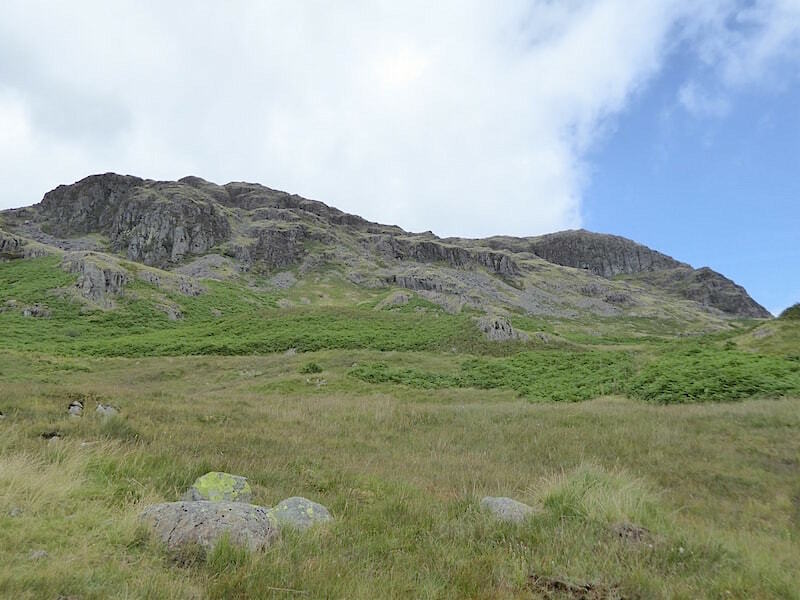 Back on the right track and a look across to Green Crag, on the left, and Crook Crag, to the right, as we continue to climb steadily. We haven’t been over there for a few years now. 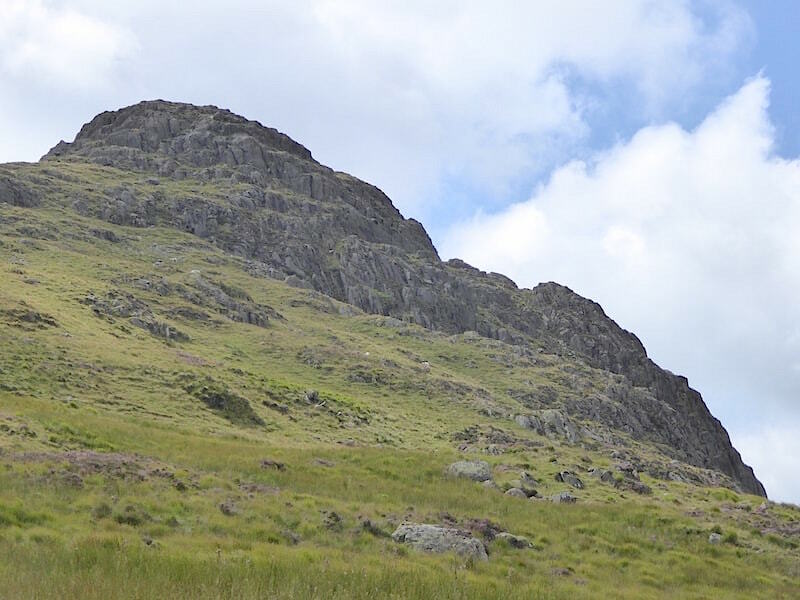 The cloud is beginning to build so this close up of Green Crag and Crook Crag looks as though the light meter needs another shilling in it. Hands up if you can remember when we used pounds, shillings and pence or £.s.d. as it used to be written. 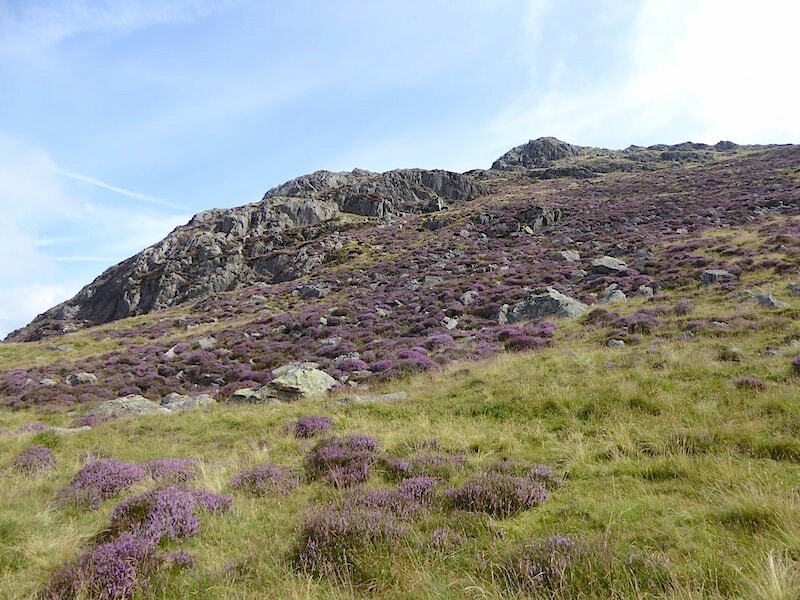 Passing below and round the crags with the heather just coming into bloom on the slopes below them, another sign that summer (what summer?) is slowly drifting away. If you look closely you will just be able to make out the lady walker in the red jacket in the centre towards the bottom of the shot. She had been following us up for a while but from here it seemed as though she had lost the path somewhere along the way and was unable to find it again. We didn’t see her again and she didn’t arrive on the summit while we were there so perhaps she gave up on it altogether. 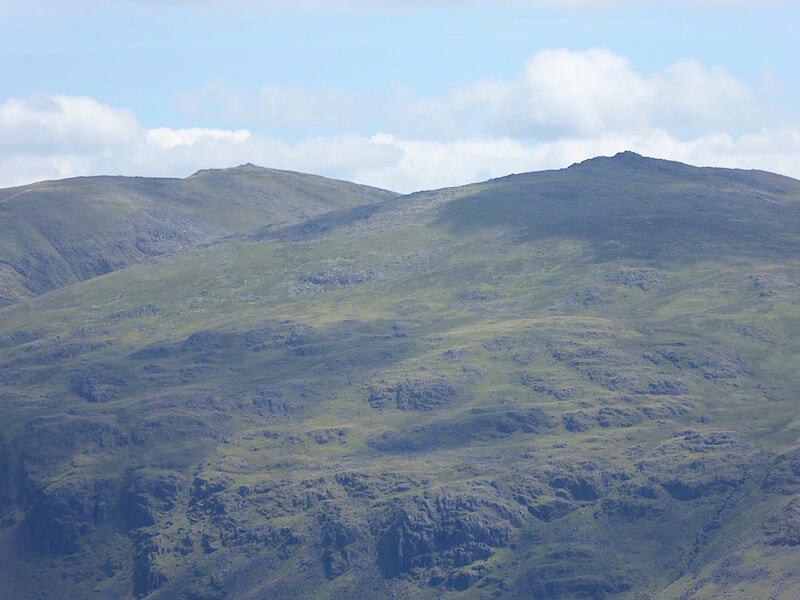 We’re a lot higher now so the views have opened up and we can see Devoke Water, over on the right, and its neighbouring fells beyond Green Crag and Crook Crag. 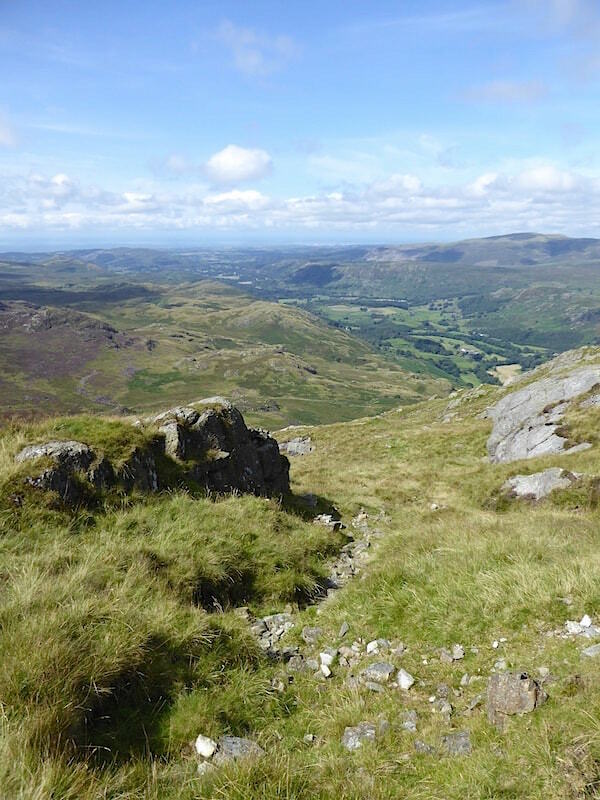 Eventually the gradient eases and as we take a short breather I have a look back down at the climb and the view along Eskdale and over to the west coast. 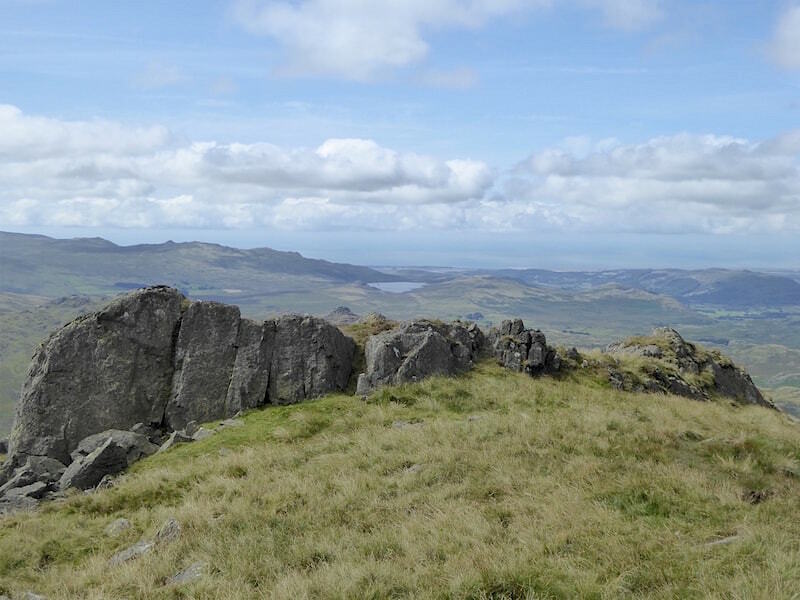 Over to the left of us we have a grandstand view of the Duddon Estuary beyond the pointed peak of Stickle Pike. The path continues across grass and we climb the last few yards up to the summit which is over to the left of the shot. 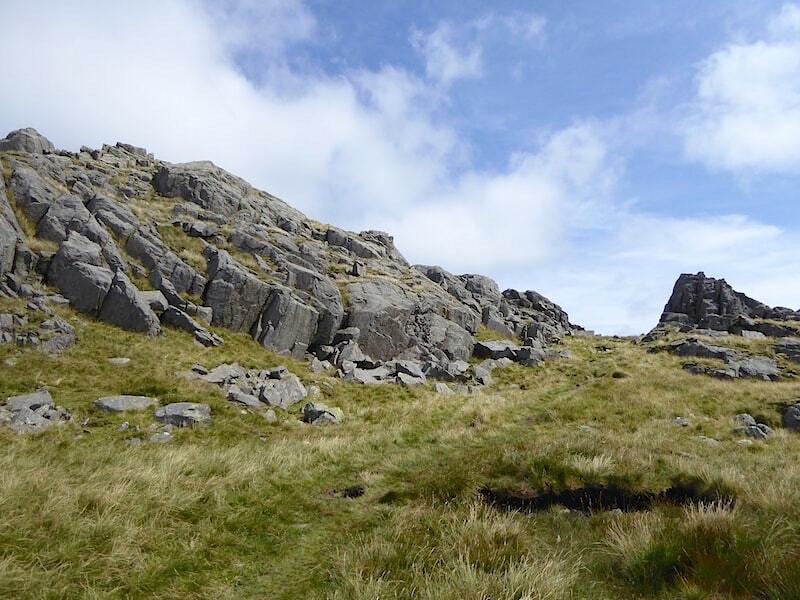 There’s no need to scramble over the rocks, unless you want to of course, because just about where the lump of rock is on the right the path turns to the left and winds its way over grass to the summit. 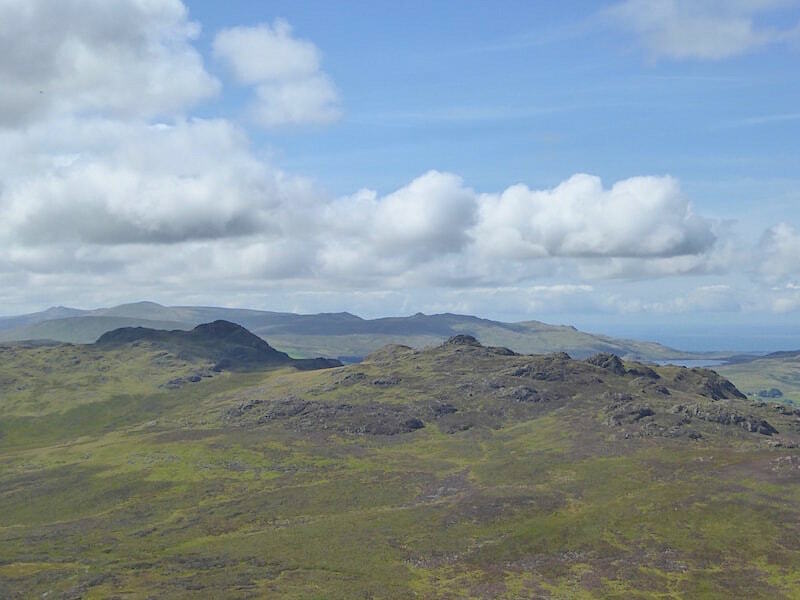 A quick look over my shoulder for a view of a distant Devoke Water …..
….. and before going up to the trig point a look along Wrynose Bottom with the slopes of Grey Friar on the right and Ulpha Fell over on the left. 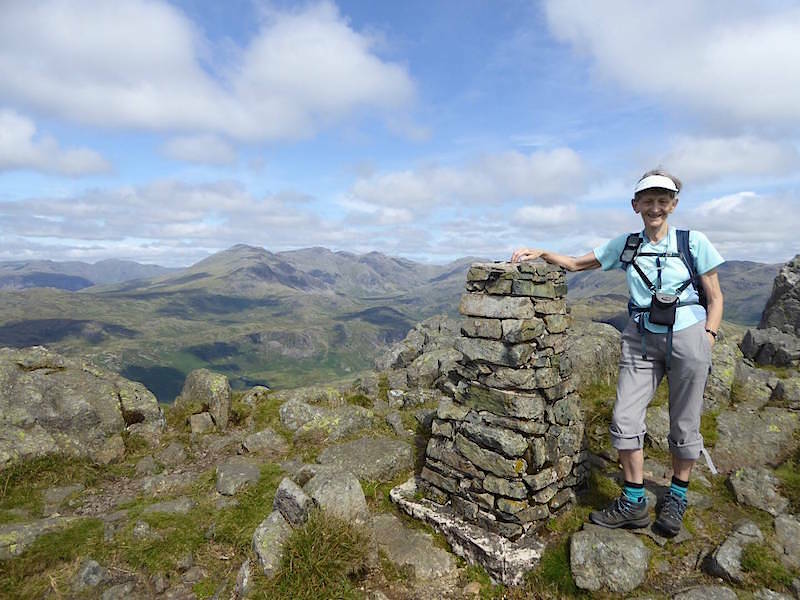 We clamber up to the trig point where we have a lovely view of Scafell, Scafell Pike, Broad Crag, and Ill Crag from left to right on the centre skyline. 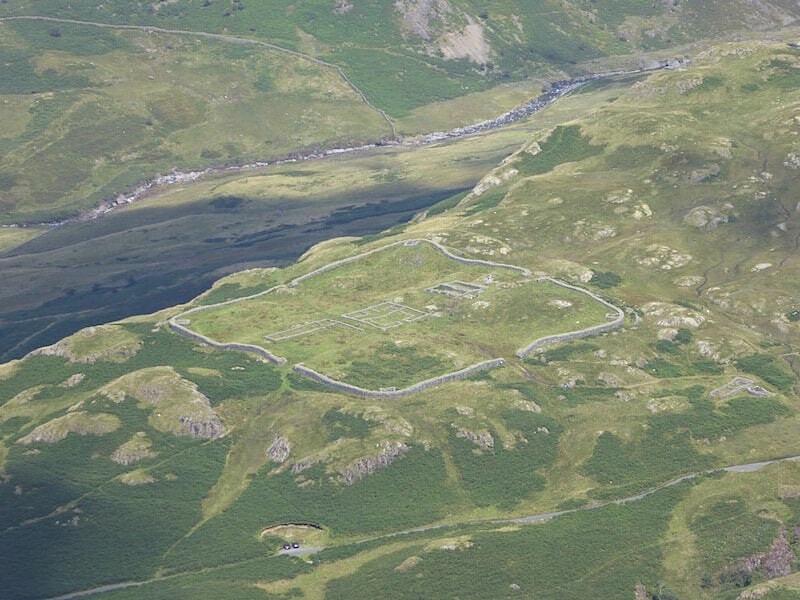 A close up of Mediobogdum, the Roman fort far below us at Border End. 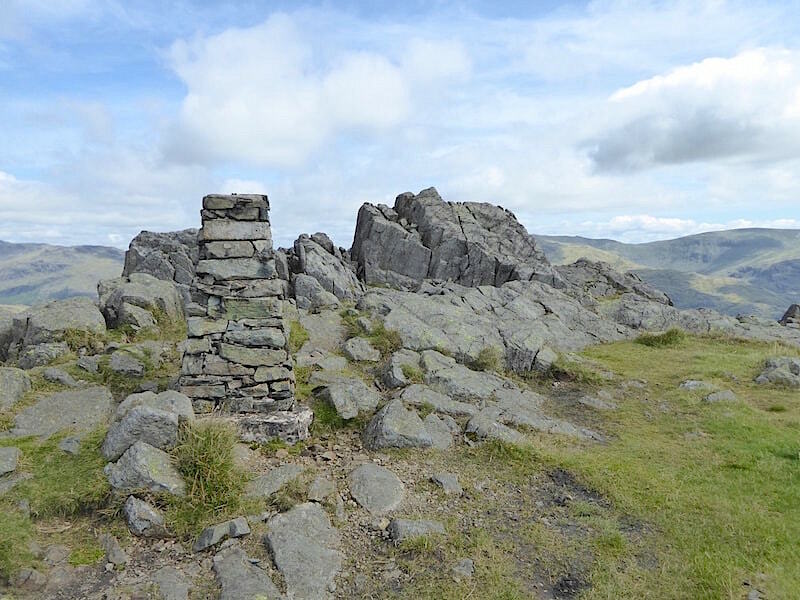 The trig point on Harter Fell summit. 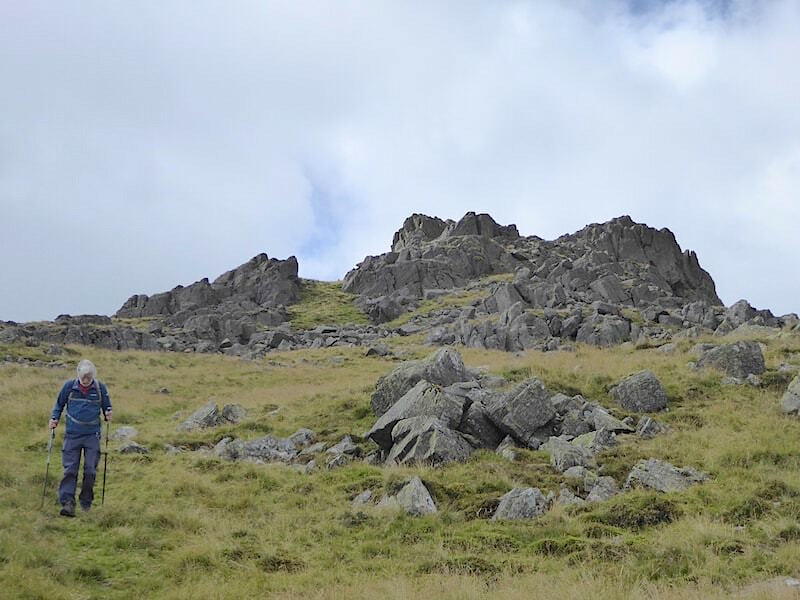 The true summit is the large lump of rocks behind and just to the right of the trig column. 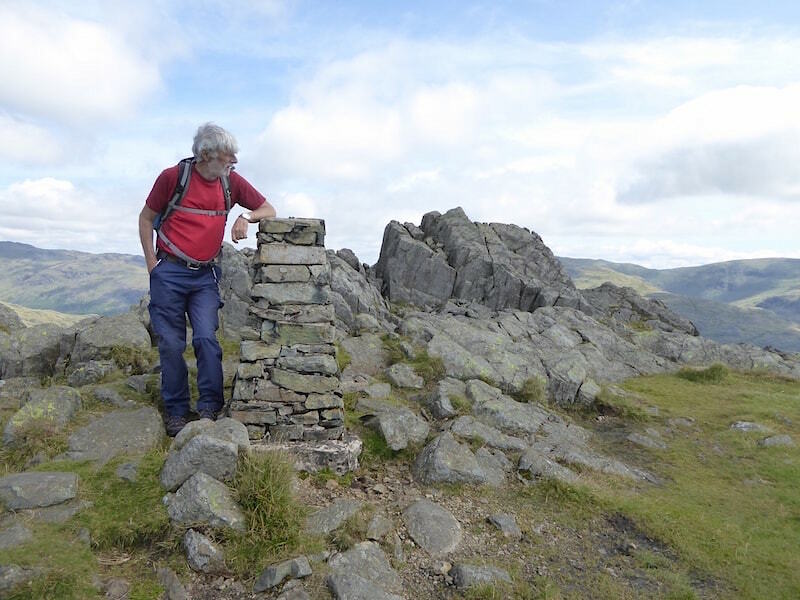 Taking in the views from the trig point. It was quite breezy up here so it was time to add a long sleeved layer before we dropped down from the trig point and headed over to the true summit. 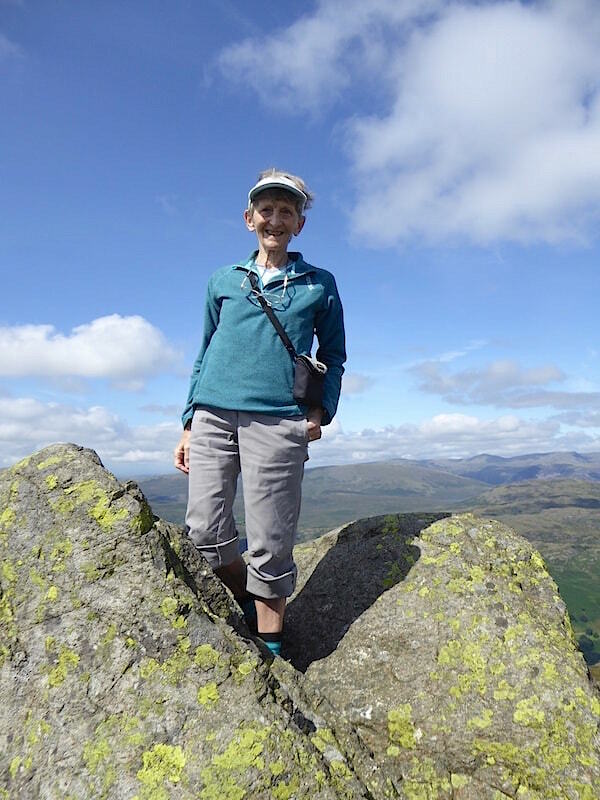 Here we are on the true summit with the long sleeved layers keeping the nippy breeze at bay. 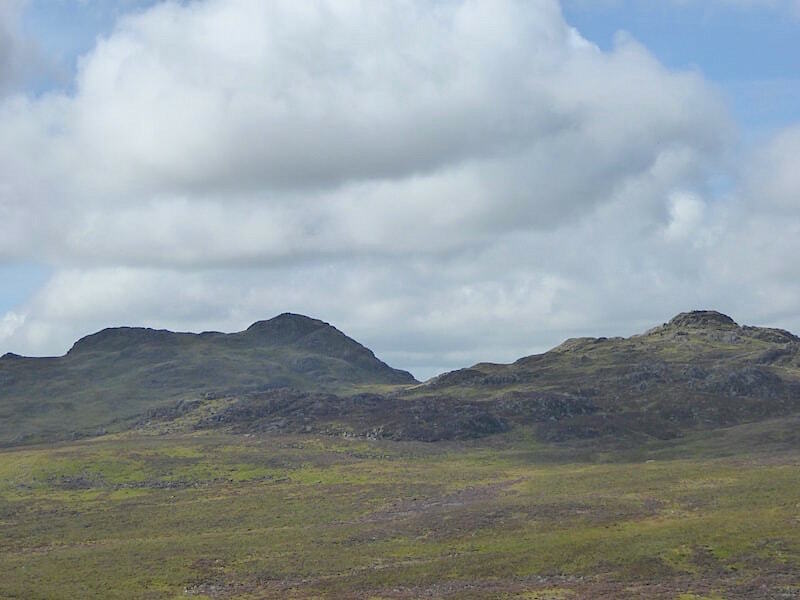 As high as I could get on the true top of Harter Fell, the two rocky lumps I’m standing between were just a little too pointy for me to balance on, especially the one to the left which is truly the highest point, so I opted for discretion. 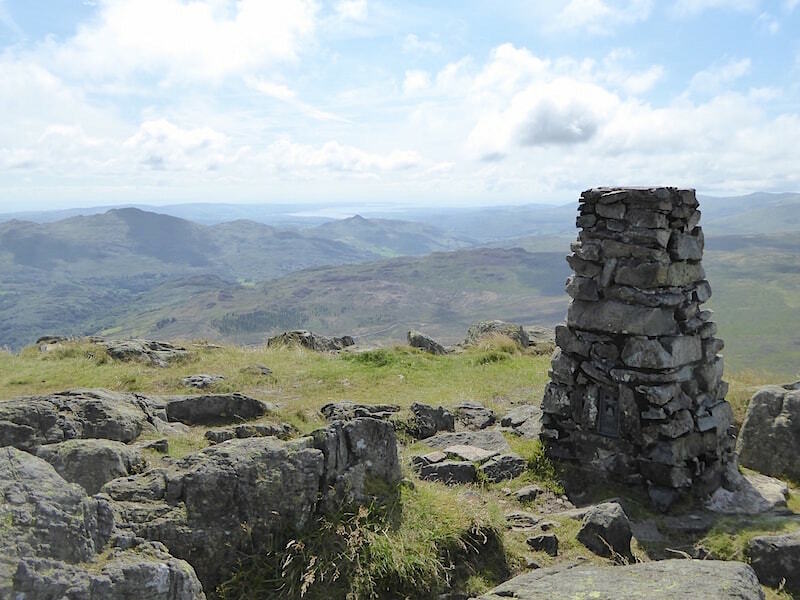 From the trig column the summit rocks look as though they would be too smooth to be scaled, but a walk round to the eastern side of them reveals a breach with plenty of hand and footholds. 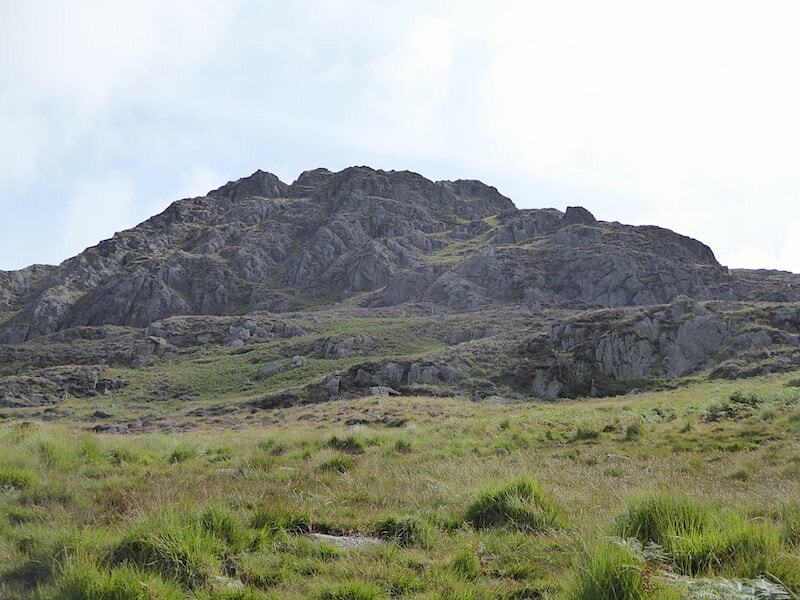 From there its an enjoyable little climb up to the top with no difficulties whatsoever. 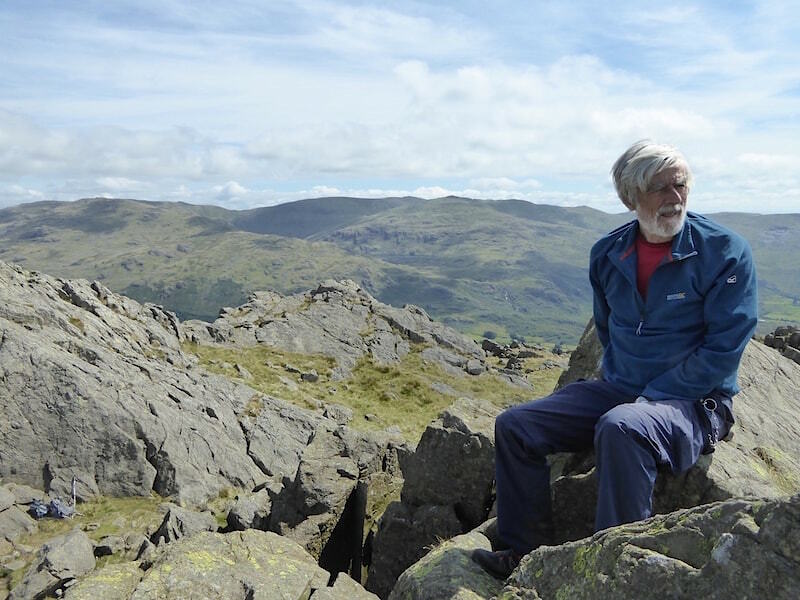 We clambered off the summit, found ourselves a sunny little spot out of the breeze and had a bite to eat and enjoyed the views. 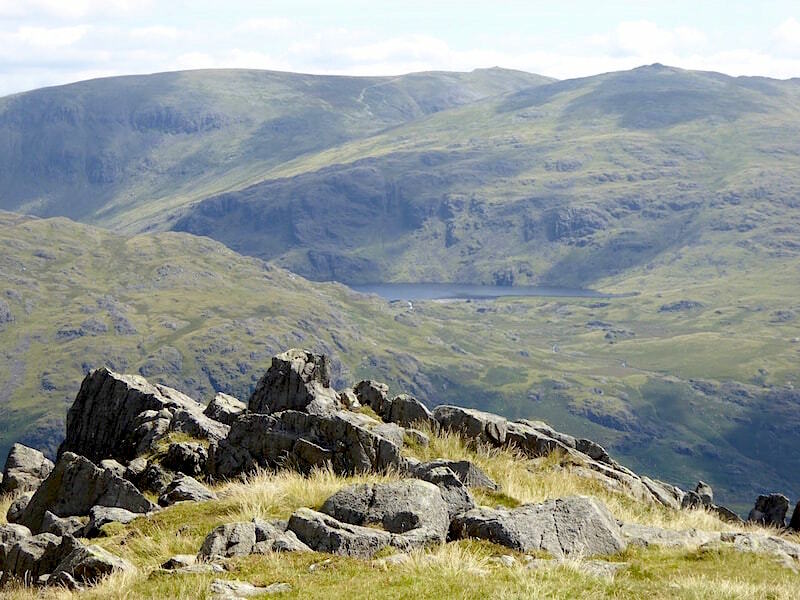 Beyond the rocks is Seathwaite Tarn and towering above it, from left to right, are Brim Fell, Coniston Old Man and Dow Crag. 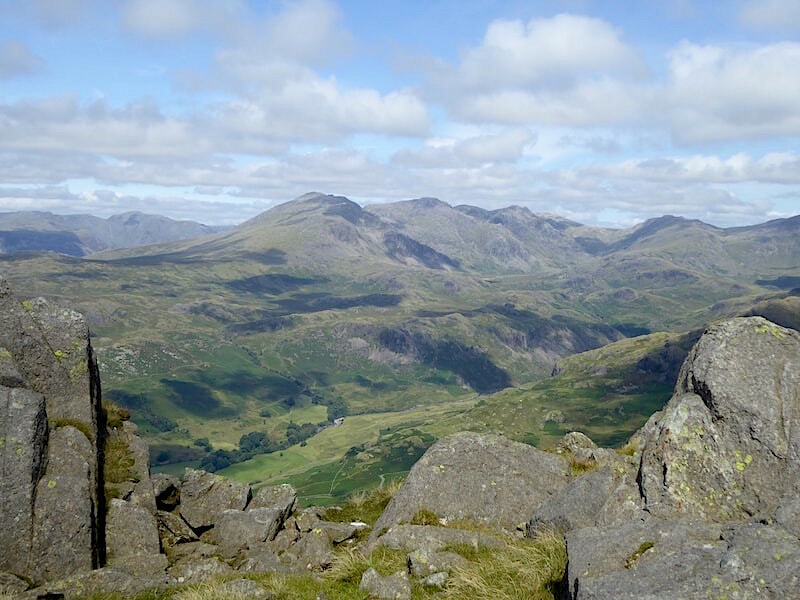 A closer look at Coniston Old Man and Dow Crag. 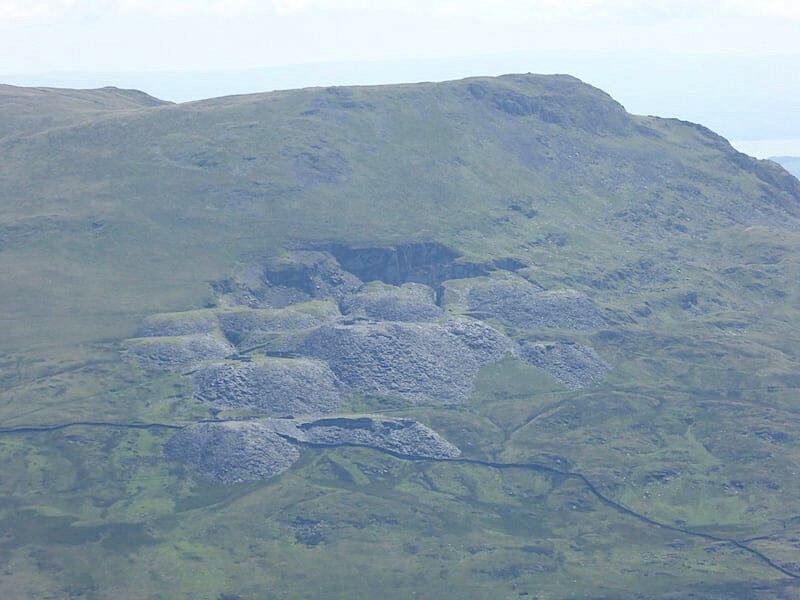 Mounds of spoil from the old quarry workings on the slopes of White Maiden. 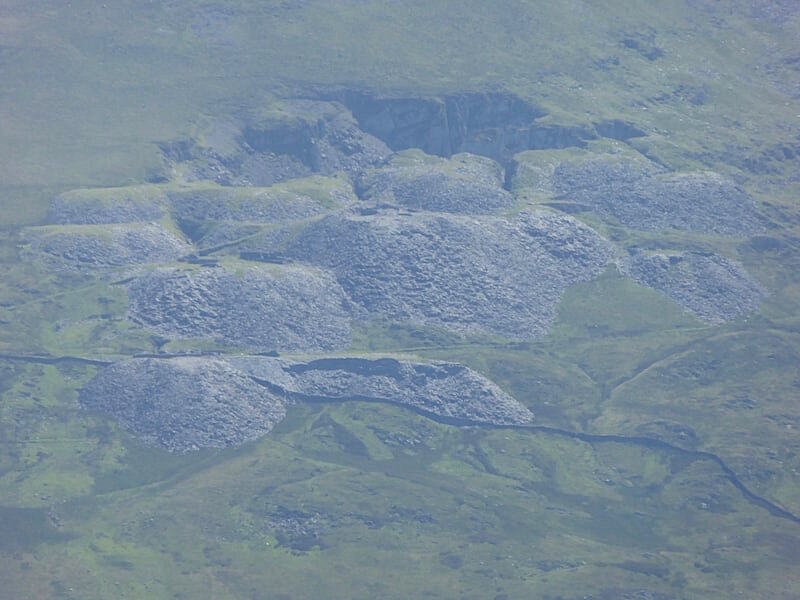 A closer look at the disused quarry. After our lunch stop I went back up to the trig column to take a few more shots of the views. 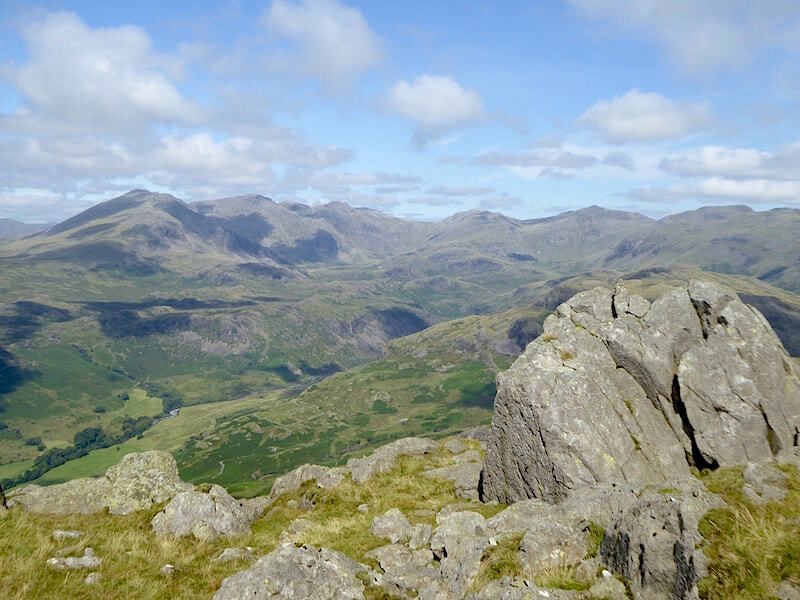 The Duddon Estuary still showing through the slight haze behind the peak of Stickle Pike. The true summit from the ‘official’ trig column summit. 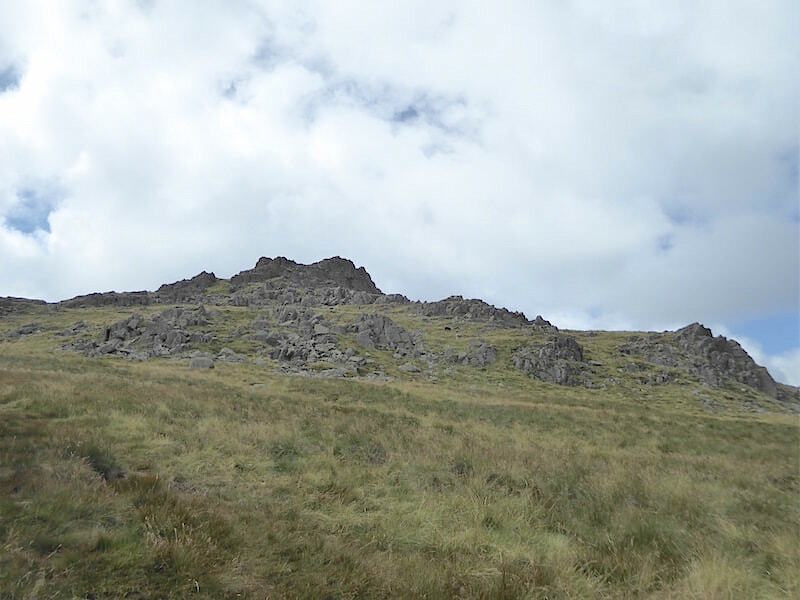 From this angle it looks as though the summit outcrop is just another part of where I’m standing and appears to be just a couple of strides away. The view is deceiving though as it is foreshortened and there is quite bit of distance between the two tops. To gain the top of the true summit we had to clamber down from this point, cross the gap between the two and then walk around the back of the outcrop to climb up from that side. 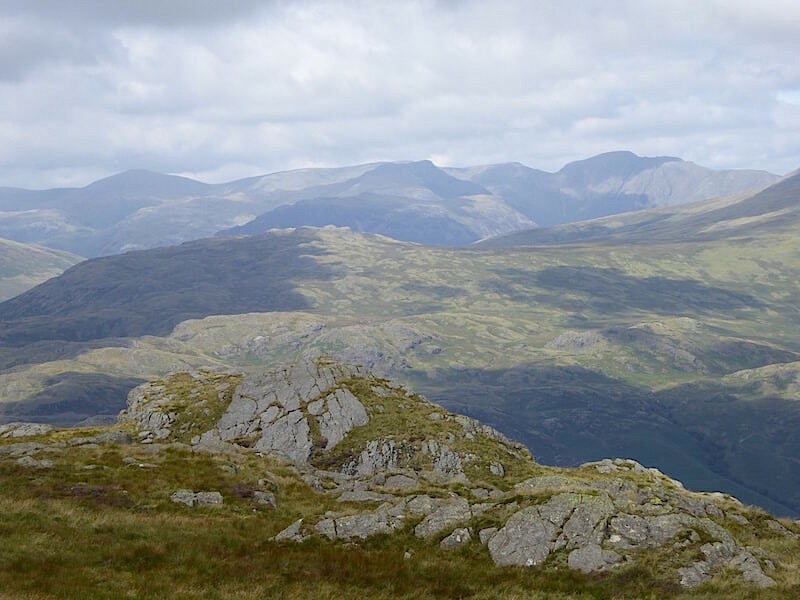 To the left of the trig column is this stunning view of the Scafells and their neighbouring fells. Thankfully the cloud is still well broken and high so we have a clear view of all of them. Another look along Wrynose Bottom as we start our descent towards what we know will be very soggy ground once we reach the lower slopes. 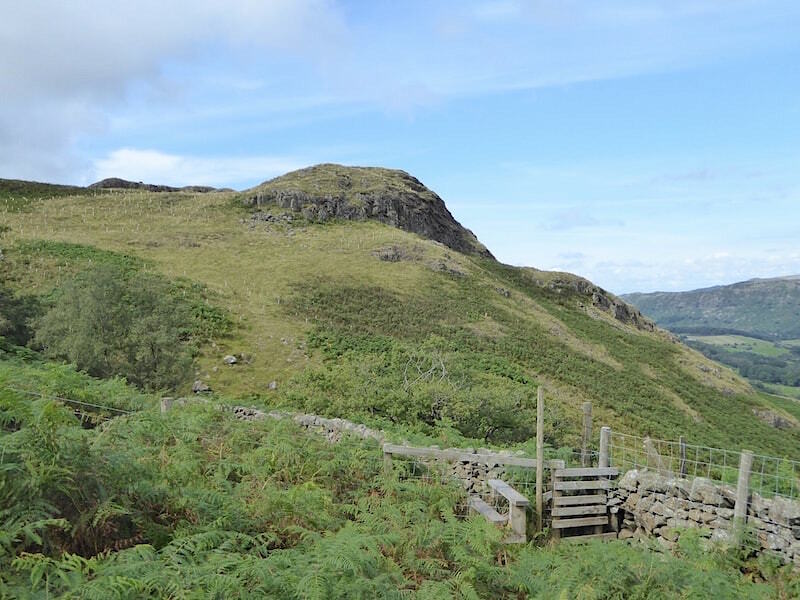 As we drop down from this point the path begins to bear over to the left leading us past Demming Crag and back to Hard Knott Pass. 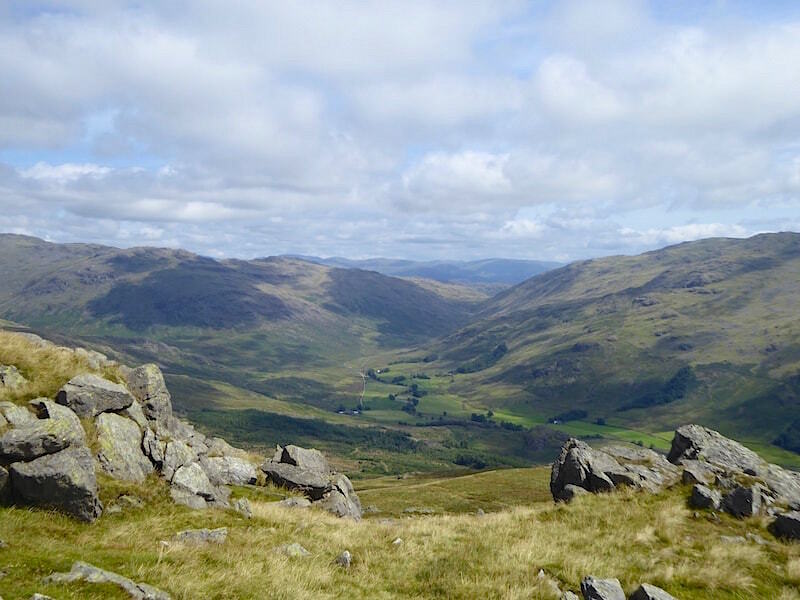 A look back from the descent at the the three rocky tops which adorn the summit area of Harter Fell. 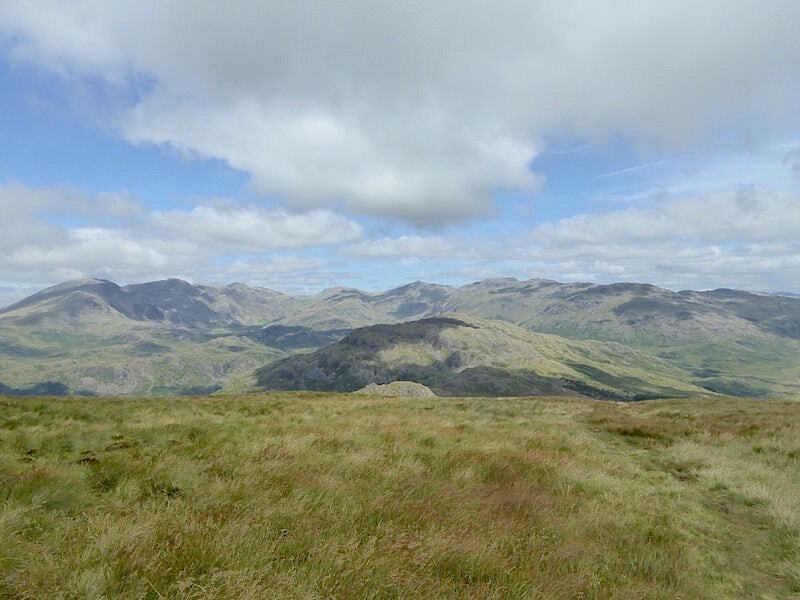 A panorama of fells on the skyline, all the way round from Slight Side on the left to Crinkle Crags on the right. 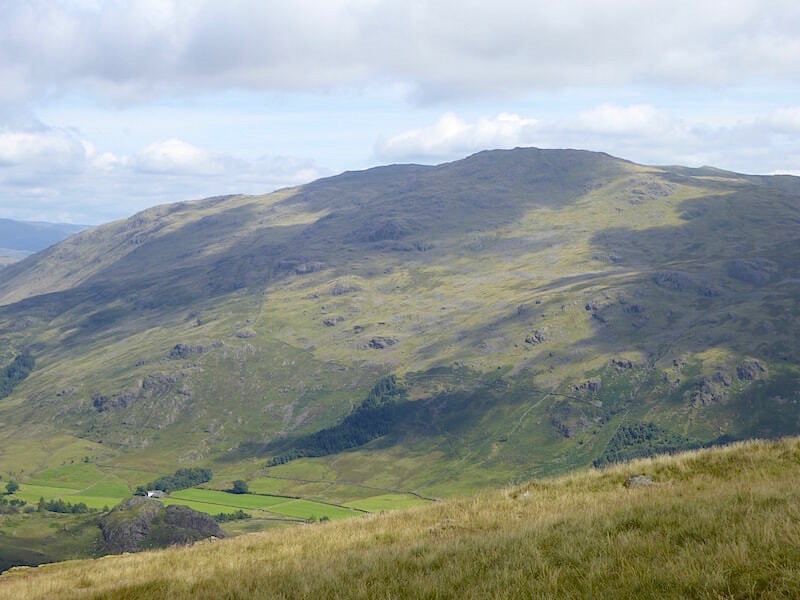 In the centre below them is Hard Knott and just peeping up above the grass is the top of Demming Crag. The grassy route at the moment is reasonably dry but that will change once we drop further down. 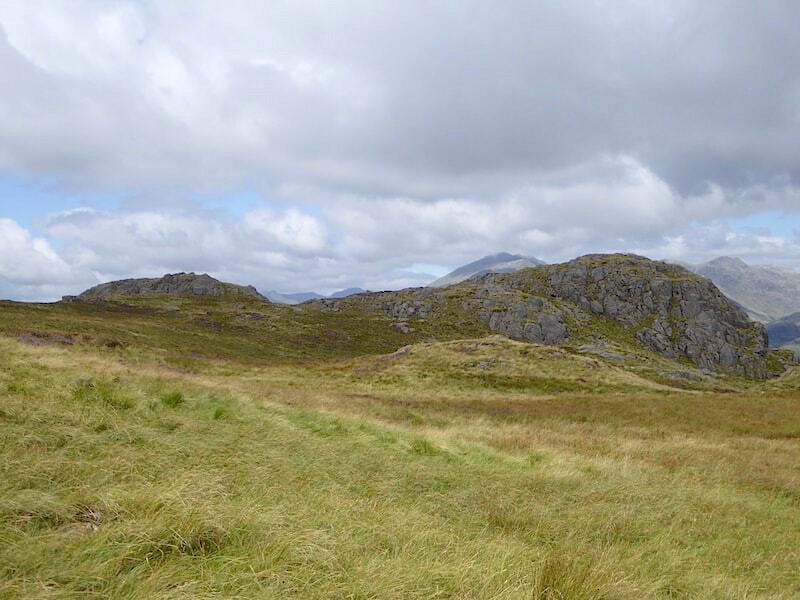 Another look back at the summit with a few more outcrops and crags below it. Ahead of us the path stretches over to the right of Demming Crag with Hard Knott in the middle foreground, and on the centre skyline is the unmistakeable silhouette of Bowfell. 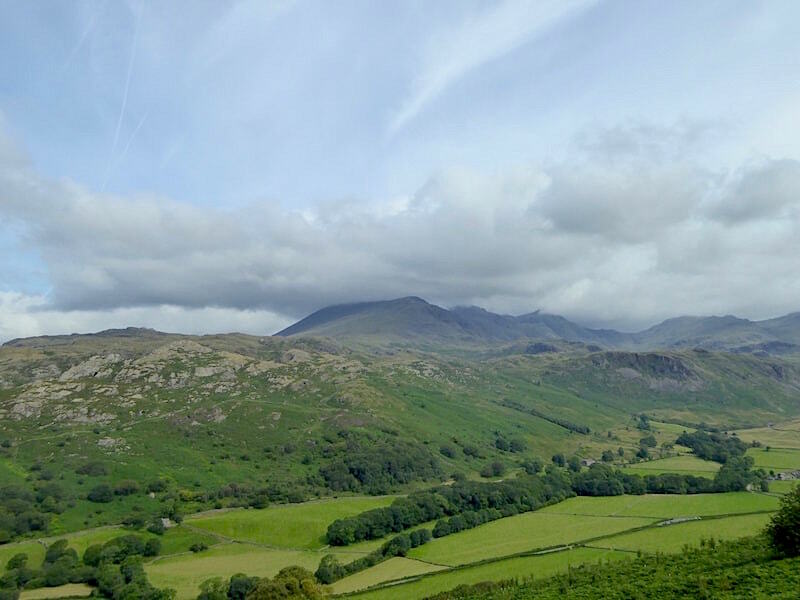 There’s a bit of haze around but despite that we still have a decent view of some of the western fells over on the skyline. 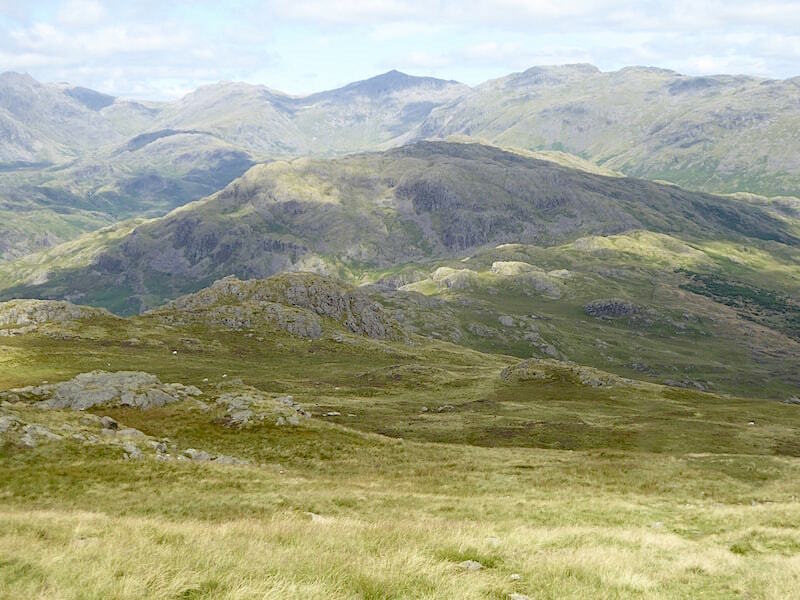 The big hump on the left is Haycock, in the centre is Red Pike (the Wasdale one) below which you can just make out Yewbarrow, while over on the right is the huge bulk of Pillar. A cloud dappled Grey Friar looming over Wrynose Bottom. The path is becoming just that little bit soggier as we approach Demming Crag, which doesn’t look much from this side …..
….. but from below it looks very dramatic. 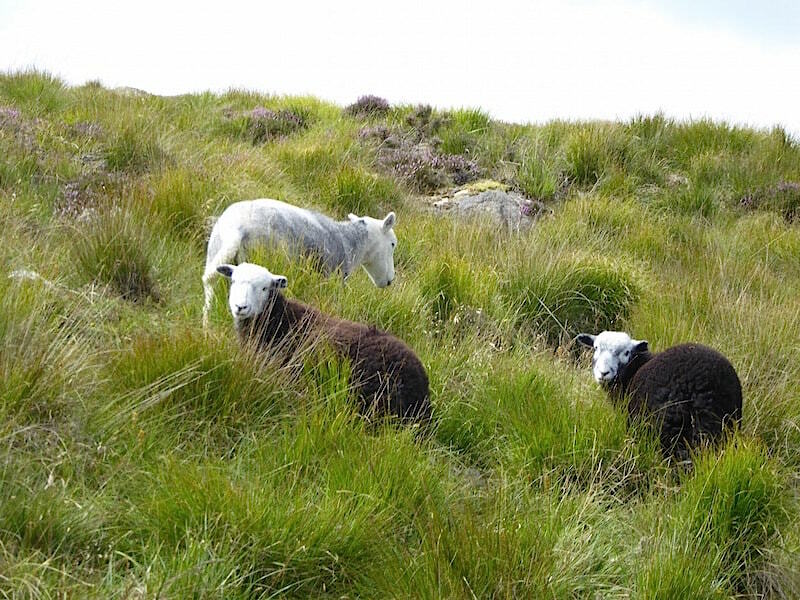 Twin Herdwicks giving us the customary Herdy stares. Mum wasn’t remotely interested in us at all and she didn’t even grace us with a glance. 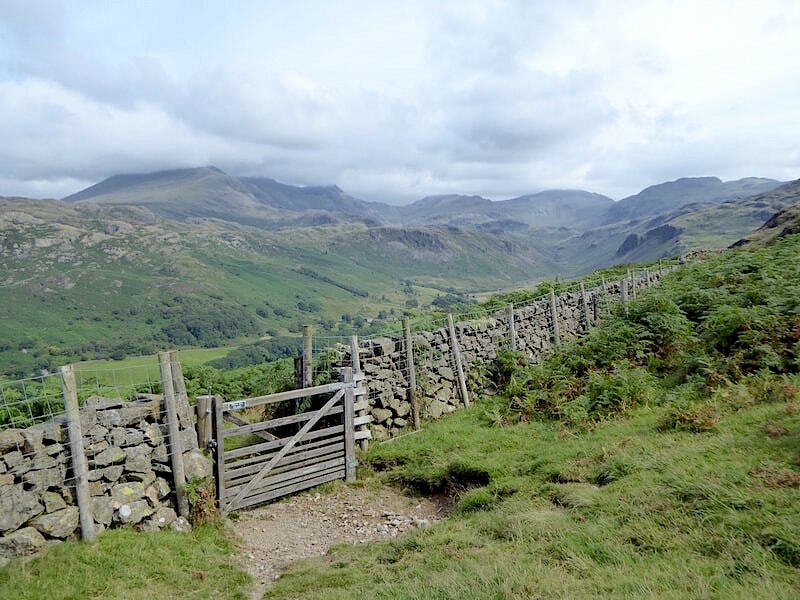 As we approach the stile we have a long view along Wrynose Bottom. Once over the stile things start to become very soggy indeed. 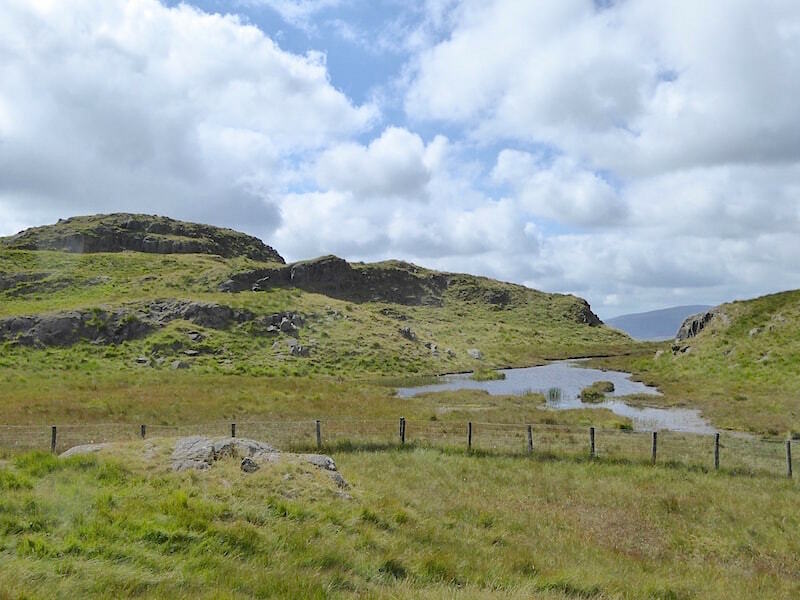 We splash, squelch and sink our way over the last section of the descent and the reach the little tarn just below Peathill Crag which is the rising ground on the right of the shot. Beyond Peathill Crag and directly in front of us is Hard Knott and between us and it is the pass road. 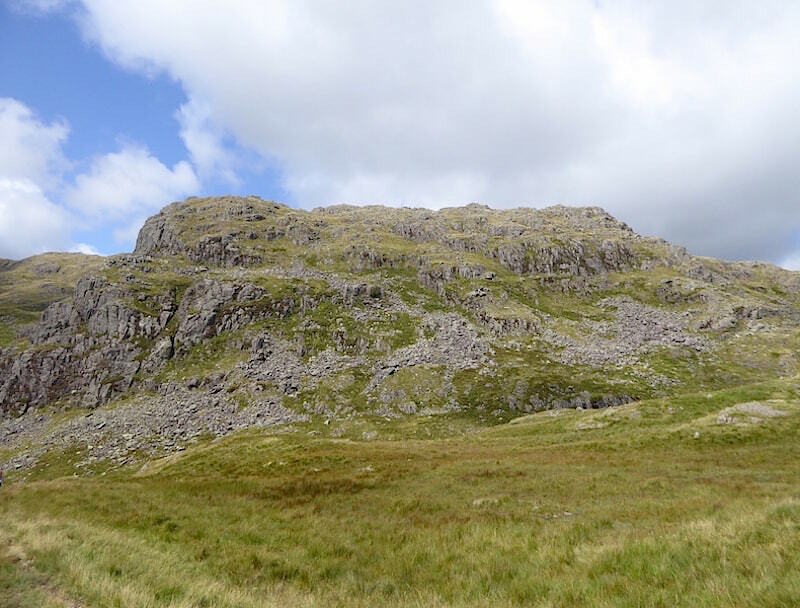 Its only a short distance from the road up to the summit of Hard Knott but as the recuperating foot is giving its owner a bit of grief following the descent, which it still doesn’t take kindly to, we decided not to upset it any further and so we leave Hard Knott for another day. 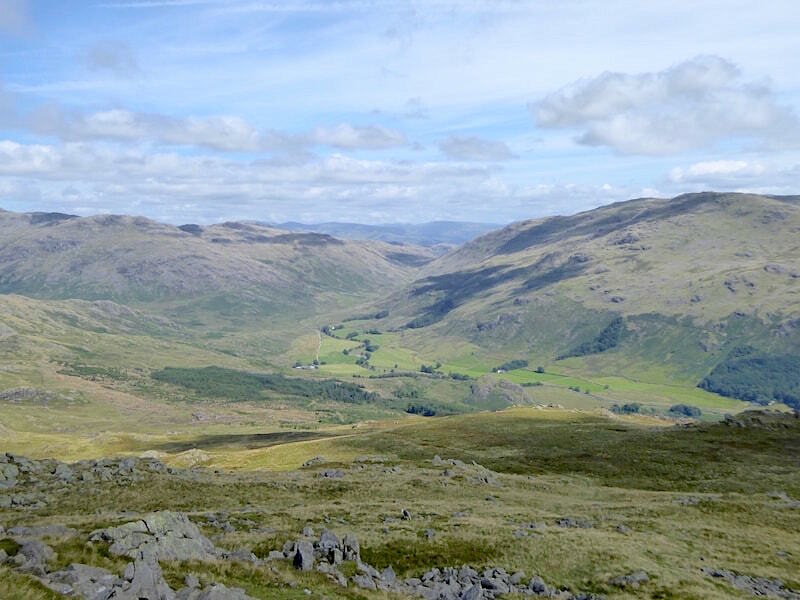 The view along Hard Knott Pass from the road walking section. As its the height of the holiday season the road was busy today and many of the car drivers were gripping their steering wheels and concentrating intently on the road whether they were going up or down. 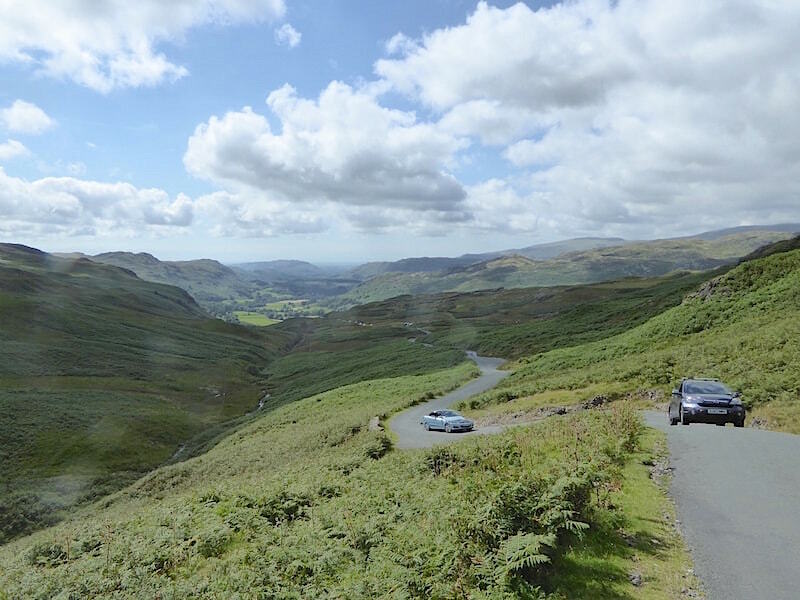 It can be quite hair-raising in places on the narrow road with steep drops and sharp hairpin bends appearing every so often. 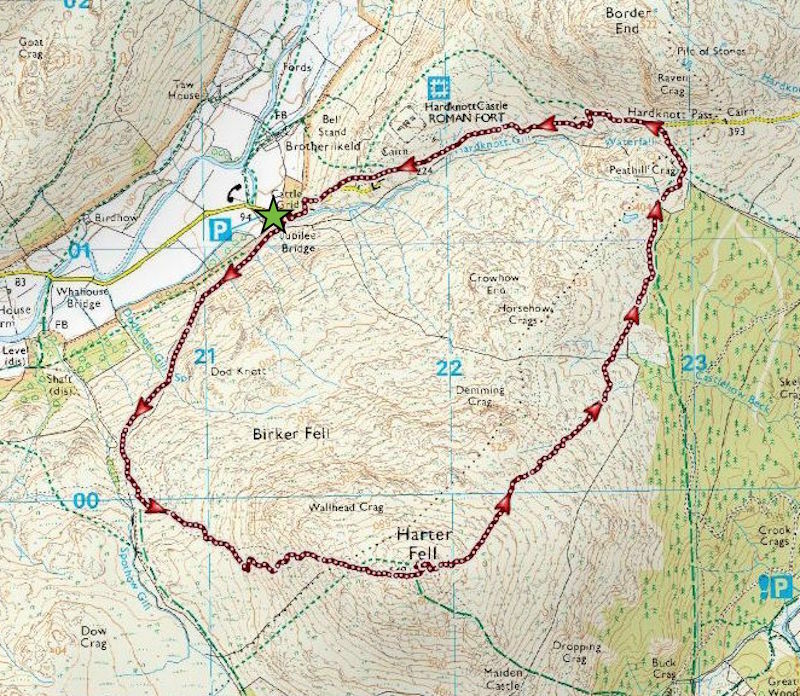 There is a footpath which takes a route across the fell side over to the right but we kept to the road for a while just to give the foot an even surface to walk on. Passing below Border End as we make our way down the road. We did eventually take to the off road path when the foot had got its equilibrium back. The wall crossing gap doesn’t easily cater for anyone who might be rather more than stick slender. 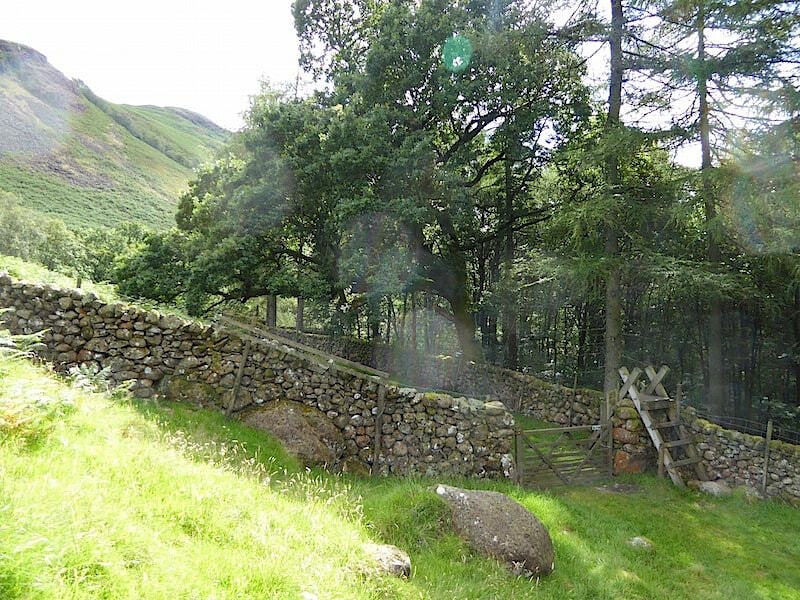 Eventually the path leads us down to this gate and stile and once through its just a matter of walking another few feet before you are back on the road at the car parking area. Sorry about the sun spots on the shot but that’s just where the sun happened to be at the time and there was nothing I could do to get rid of them. So we end our walk today with soggy boots but feeling much better for having been out in the sun and fresh air. All we have to do now is get in the car and make the long drive home, by which time we will have spent more time driving here and back again than we have actually walking. 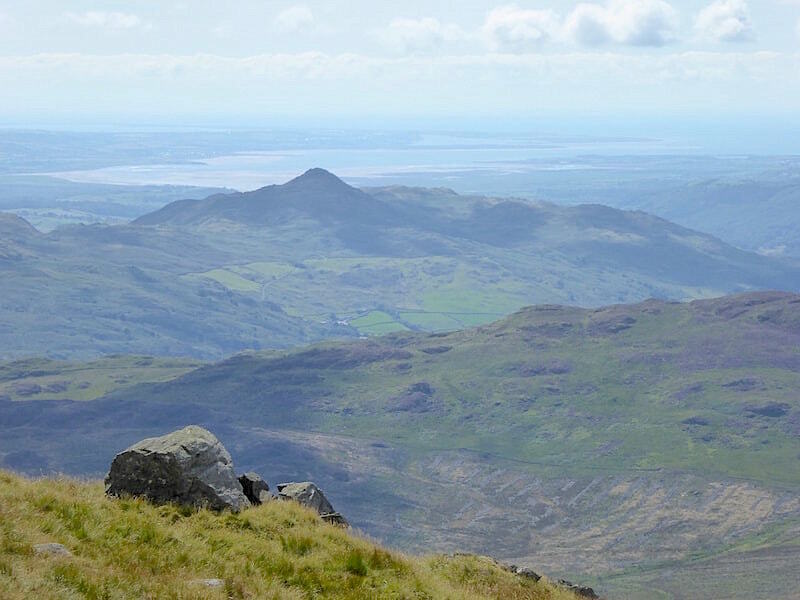 We live over in the east, this is out on the west, and with an awful lot of mountains between the two there’s no easy or straightforward way of getting from one to t’other. If the weather plays ball before the autumn sets in we might even get another trip in while we still have the daylight hours on our side, so I’ll be keeping my fingers crossed.